Based on her recent research with The Financial Post Top 100 Companies, Dawn Frail reveals what companies need to know about women leaders, and what women leaders need to know about companies. The Ruby Report addresses the three critical initiatives that companies MUST have in place if they wish to profit from a gender-diverse leadership team. If your gender diversity efforts aren’t paying off, then this book can help you figure out why. 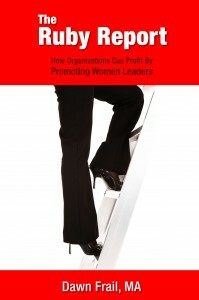 Filled with revealing insights from women leaders about what really helped get them promoted, this book is a must-read for companies ready to profit by letting their talented women shine.